​This week students in Ms. Wersal and Ms. Sheaffer's classes explored creating a setting using different tools like Osmo Masterpiece, Toontastic, and Bloxels EDU. ​Ms. Kinsley's third grade learners started using Osmo Pizza, Osmo Mindracers, and Osmo Numbers. This week Ms. Sheaffer and Ms. Wersal's third graders started the first mission in our Design Thinking Fairytales project. Designers had three tools to choose from - Osmo Masterpiece, Bloxels EDU, or Makers Empire. Over the last few weeks, students in Ms. Zorr's classroom have been using Osmo Masterpiece to create their own unique butterfly or moth. The drawing is then photographed and edited before using lithophanemaker.com to create a custom night light. ​Now the designs are being printed on the Prusa MK3 and the designs are beyond beautiful. 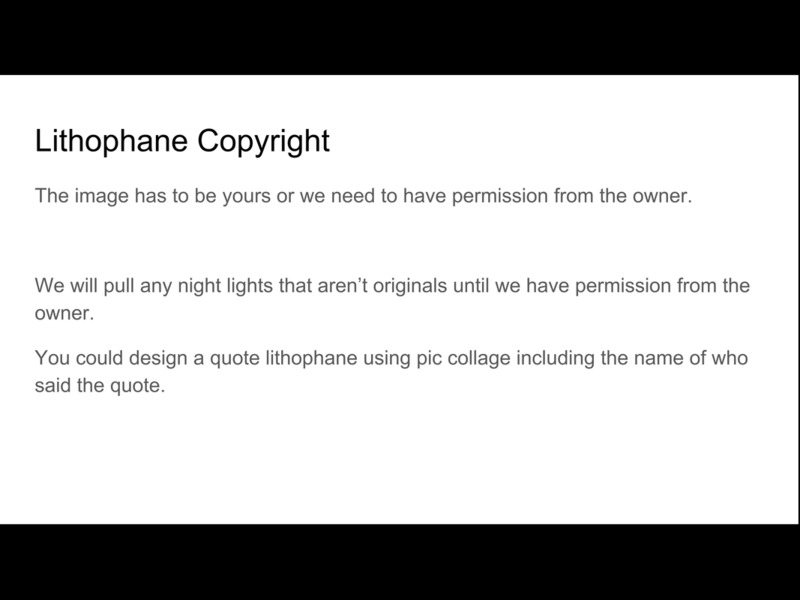 ​Keynote is an excellent tool for integrating copyright friendly images and quotes to create unique images for night light lithophanes. Here is the process of using Keynote on the iPad and Lithophanemaker.com to create a unique night light. Today designers in Ms. Zorr's class are one step closer to their final night light lithophane. After drawing two butterflies or moths, designers outlined and shaded their final images. From the two drawings, designers selected their favorite image and took a picture with their iPad and cropped the image. ​Next week, designers will be using lithophanemaker.com to create the design code for the lithophane. New designs are coming in our lithophane night lights. Fourth and fifth grade students are designing and getting new designs ready to be highlighted by this Friday, March 15th. Right now there are 7 designs but it will double by this Friday. ​Check out the website to order. Today is Day 4 for Ms. Zorr's designers. Today designers resized images using Osmo Masterpiece to use for their lithophane designs. The other part of the group focused on the monster challenge to practice designing in Makers Empire. ​Even though we are using lithophanemaker.com for the final design, it is important that designers have more experience with 3D design then just choosing an image and converting it to a lithophane which is why each week has a design challenge in Makers Empire. Creating for a Cause brought a value for building an understanding of copyright. While using a photo from google for a project that is a student project could fall under fair use, selling a student project as a fundraiser is no longer fair use. This gave our designers the opportunity to create in a different way. Designers are now creating in Keynote or Pic Collage.